When the weather is warm, and the last thing you want is to turn on the oven, these easy, no-bake cornflake cookies are the answer. With just three simple ingredients, these crunchy, sweet, and nutty treats are tasty enough to stir together year round. The only equipment you need is a microwave or stove to melt the peanut butter and butterscotch chips, and a refrigerator to chill the cookies. Enjoy them directly from the refrigerator with a tall glass of cold milk. They are made of cereal, after all! If you want to save some for later or share them with friends and family, store the remaining cookies between layers of waxed paper in an airtight container in the refrigerator. In a bowl set over hot, not boiling, water heat butterscotch morsels and peanut butter. Stir until melted and smooth. Alternately, the butterscotch morsels and peanut butter can be melted together in a microwave-safe bowl in the microwave. Heat in 30 second intervals, stirring each time until melted and smooth. Stir in corn flakes cereal until well coated. Drop from a spoon onto a prepared cookie sheet. When the cookies are ready, carefully peel away from the waxed paper. Store in the refrigerator in an airtight container between layers of waxed paper. 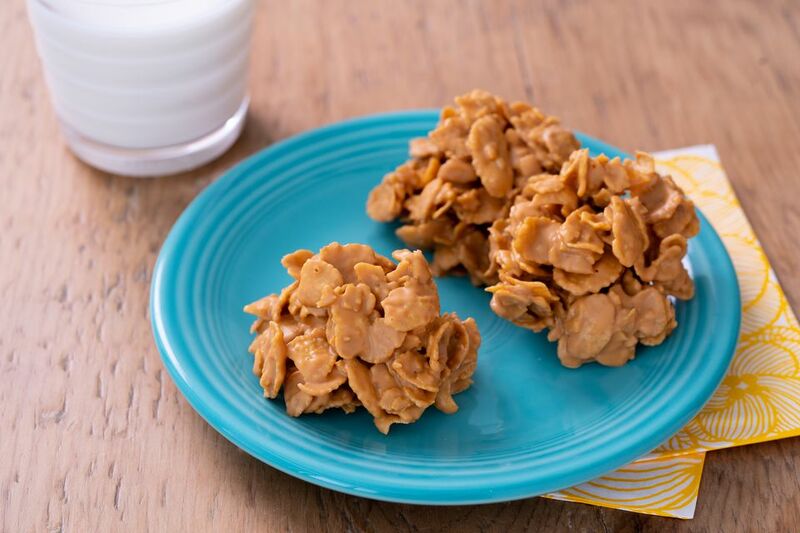 Enjoy cornflake cookies with a cold glass of milk!